Well look what we have here… finally some real confirmation. First came the leaks back in December, then it passed the FCC with AWS bands, then a (possible) release date, and now it looks like it’s about time to be unveiled. 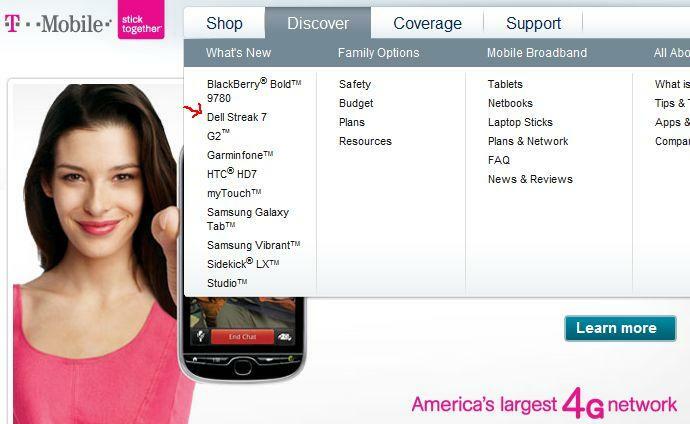 Does this mean we’re going to see the Dell Streak 7 announced at Thursday morning’s T-Mobile Press conference? We’ll be there covering it live at 11am PST. Just purchased a Defy this week but if they announce the streak 7 with calling abilities then this defy is so going back. I’ll wait for the G-Slate. That will 8.9″ with Android OS 3.0 and a dual core processor. In other fascinating News, T-Mobile is still selling the discontinued Sidekick LX. What’s up with that?!? LOL and whats funny is they still say its “innovating”. T-Mo sells refurbs in stores of old stuff that are discontinued. You just gotta be impressed with T-Mobile. Big changes compared to the same time last year. Our progress has been slow, but with all these devices coming out….man oh man….this is good stuff! Competition is going to get heavier, neck to neck. All we have to do when it’s all said and done is back our devices up with MAJOR PR in forms of awesome commercials and advertisements. I’m sorry but… no I’m not, Who needs another tablet running a phone OS(probly not even Gingerbread) that probly doesnt even have phone capabilities??? I love Dell. hopefully their phones are as good as their pc’s. I bought my laptop october 2009, still runs flawlessly and still holds its own against bigger boys like Alienware and FalconNorthWest. And costs half as much. Keep em coming, Dell. I will give TMO credit. They seemed comfy being viewed as the lil brother to the big guns, but they seem to be growing up in a major way. HSPA+ devices and beastly smartphones (Talkin bout u, optimius 2x) really shows that they are no longer content with just a tween crowd. 2011 is shaping up to be a very good year for us gadget freaks. I should hope not. I wouldn’t take it free in that case. does anyone know when tmobile will be releasing new phones?